So, about a week into my university life I discovered SUCC. Possibly the next day somebody mentioned a holiday. Well, I wasn’t going to be sticking around in Southampton when I could be cavorting around on the beaches of Cornwall, was I? Following a rather amusing intro talk filled with alcohol, flour and water I remember vaulting a couple of rows in the lecture hall to hand in my cash. I really wasn’t planning on missing out! Cutting to the point and avoiding furthering an apparently well established SUCC custom, I turned up at the boat hard on time and then waited. For a fair while… But after, among other things, establishing the sheer quantity of fresher’s bestowed with the name Thomas, we piled onto various modes of carriage and headed forth to the fair West Country. If the antics on the bus didn’t quite live up to the stories foretold, it was more than made up for when we piled off of Red Leader in the chilly night air in Newquay. There were games, drink, drinking, drinking games, a little strip trip to the beach. I felt at home already. A couple of hours sleep ensured we were all bright and fresh for the latter hours of the morning at which time us newbies were bundled back into the buses and along the familiar roads of Cornwall. Unfortunately not everyone knew where they were going. Nevertheless, Perranporth eventually veered into view and after much ado about nothing, we got stuck into the surf in pairs with the timeless advice “if you go over, pull this loop here… and don’t breathe it in”. Excellent! I loved it. It whipped back at the face like hail in a hurricane. A significant number frequently found themselves miraculously self righted in the breakers and I pulled off an impressive unintendo involving nosediving into the beach and staying longer than I’d have liked in a vertical limbo. Swim followed swim followed swim and then some ponces got cold so we hiked back up the beach for pasties. That night followed roughly the same formula as the first, only my part of the equation involved rather more rummmmm and ciderrrrrrr. As a result I made my acquaintance with the cold and wet, yet surprisingly cosy football pitch outside. I was put to bed but some crazy fools decided to sleep outside in the dugouts anyway. Good on you! The surf on Sunday was a little less mental by most standards, which enabled the majority of us freshers to get out onto the bigger waves out back. I was concentrating far too hard on not breathing in the Atlantic but I’m told even some of the more established club members enjoyed themselves too! Many, many thanks to Matt Kelly and associated minions for organising a truly memorable SUCC trip. 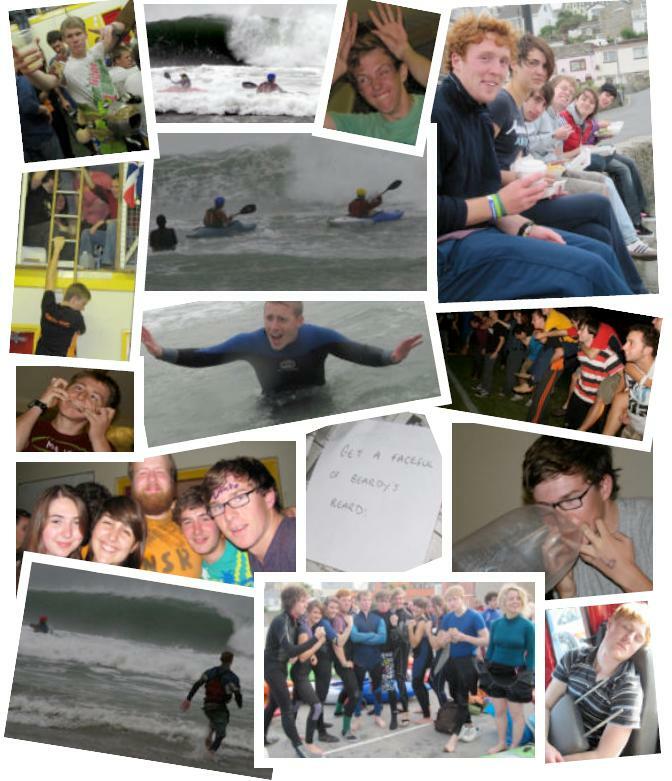 Posted in Trips and tagged Canoe club, Fresher Trip, Kayak, Kayaking, Newquay, Southampton University Canoe Club, SUCC, University Canoe Club.